"Collaborative learning is based on the idea that learning is a naturally social act in which the participants talk among themselves (Gerlach, 1994). It is through the talk that learning occurs." iEARN is one such online collaborative platform where young people think globally about the sustainability and well being of the globe and its people. Through this platform more than 130 countries use the internet and digital media to collaborate on several meaningful educational projects that are available for teachers and other professionals to use. This paper describes the benefits of the iEARN experience as an example of synergistic learning for pre service teachers in Mumbai, India. The pilot project involved 14 pre-service teachers who signed up voluntarily to trial run some of the projects on the iEARN website by conducting action research. In the process of doing the same they interacted on the website, got inputs from teachers from different countries in far off lands, which acted as motivation to carry on the project. The study also aimed at understanding the reasons that motivated the student teachers to take up such a project and experience that these pre-service teachers got from participating in such collaborative learning. The findings of the study will help to upscale the experience to larger number of pre-service teachers and involve more teacher education colleges in India. Key words: collaborative learning, synergistic learning, teacher education. Vygotsky stated that learning is a social act and must not be done in isolation. This principle is the foundation of collaborative learning. In a collaborative set up, learning occurs though active engagement among learners either face-to-face or online. Collaborative learning provides opportunities for students to learn from their peers within the classroom and outside and develops effective teamwork and communication and develops interpersonal and cross cultural awareness. The iEARN experience with its online collaboration along with the advantages of collaborative learning brought additional benefits of flexibility to the training and research component in the teacher education program provided to pre-service teachers at Smt. Kapila Khandvala college of Education, Mumbai India who were part of this first pilot project. The project is about involving Pre-service teachers in the iEARN Platform to collaborate and conduct classroom based inquiry. The pre service teachers in Mumbai have an action research component as a part of the syllabus. In this pilot study, a cohort of 15 student teachers of Smt. Kapila Khandvala college of Education in Mumbai were oriented to iEARN as a global organization and introduced to the different projects on the website. Nine teacher educators were also a part of the orientation. An overall coordinator from the college managed the group and coordinated activities communication tools like Whatsapp. After the initial orientation, the student teachers and teacher educators were given hands on experience in the computer lab to explore the projects on iEarn in different categories. Post the training there was an orientation to explain how to choose one or two projects that can interest them and convert that to an action research problem that has measurable learning outcomes. How to construct tools for the samewas explained. Student teachers conducted these action research projects which they had sourced from iEARN website and tried out in the neighboring schools. The experience involved a lot of learning for both student teachers and teacher educators. The interaction on the website, sharing their ideas, getting responses was an exciting idea for the group. There was palpable excitement when a student came and reported that she had received a response from teacher far away in a different land. One of the motivation factors of this collaborative learning was receiving some response from an overseas teacher or educator in another country. Sometimes the simple act of not being able to post on the discussion board of the iEARN website and communicating the problem to an admin person of iEARN and receiving mail to solve the problem made student teachers happy. 1. What motivated you to join iEARN? due to the opportunity iEARN provided to share their work with educators worldwide. because the iEARN project provided a collaborative learning experience at a global level. On a common topic/activity they could connect with people in different countries. Majority of the student teachers had identified the global connect & collaborating with educators world wide as a reason for their motivation. 2. What were your experiences with implementing the iEARN activities? The responses indicate that student teachers mentioned different reasons that made the experience good or interesting for them. Majority of the responses fell in the first three categories which means they value taking the projects to the students in the school. They also used a lot of adjectives like amazing, interesting, life time experience, enriching, and wonderful. Majority of the experiences centered their experiences on the students learning in the school which is interesting as these student teachers were conducting an action research and theprimary goal is to make learning interesting and useful in the classroom. 3. Where and when did you carry out your projects? All the student teachers had carried out their project in schools. They had worked in the monthof February to Mid March roughly six weeks. 4. Did you get on to the website and post your comments/share your learning’s? All most all (99%) had browsed the iEarn website and had at some time posted some of their thoughts and ideas. Nearly 80% had received some general response or remark from some one appreciating their work. 2% had received specific comments for the projects chosen. 1% had not really used the website much.Most of them said the comments or response they received from different people in the world excited them to go back to using the website and was the one of the reasons for theirmotivation. 5. What challenges did you face with your iEARN project? Too many activities listed on the iEARN website and choosing which project waschallenging. Challenge to prepare a pre test for the project. Initial struggle to learn how to communicate on the website forum but soon they learnt. Some technical glitches in the beginning of the project with iEarn website not being ableto register, not able to view their comments. 10% said managing time was a challenge. More than 30 % said they faced no challenges. 6. Can you relate any one experience that you think was significant for you in the iEARN project? When they were carrying out some activity in the class and students responded favorably. When they shared their projects and immediately got a response from someone in another part of the world. Experience related to the plastic foot print activity in the class. When the children in the project ‘ One day in my life’ sang the song ‘Give me some sunshine, Give me some rain. Majority of the significant moments reported were with reference to children in the class or when the received a response on the website. 7. Please share your general reflections on the experience in iEARN in a few sentences. "I personally enjoyed executing these activities with students and I would love it if these activities would be carried out in each and every schools so that students can enjoy and express their own views. In a few days, I had created a special bond with these children. It was a great experience." 1% said more frequent meetings for iEARN students. 2 % said some guidelines to interact on the forum should have been circulated. 1% said iEARN should provide a letter explaining how this will help them in their world of work so it can add value to their project. 3% said Technical support on the website should be quicker and more efficient so the motivation is sustained. Majority said they have no suggestions they are content/happy with the experience. Few of the teacher educators involved in the project said they enjoyed guiding the students for iEARN. They were satisfied with the work carried out. They said it’s a good idea to provide students such collaborative platforms and international experience. Some said they were happy that their students could get lovely products out of the children’s work to display on the website. Vygotsky specifically stated that learning is a social act and must not be done in isolation sums up the experience of the project. The train the trainer model was used to get student teachers carry out action research projects for iEARN. The teacher educators were oriented to the project and their role in it. The cohort group of 15 students was placed under different guides to oversee the action research. Rather than pick random activities the cohort was trained to pick activities that match their goals or learning outcomes. So there were several interesting titles that emerged such as ‘Creating caring responses through literature and art.’, ‘Developing intercultural awareness among students of std VIII, “Creating a Sustainable outlook through Mathematics. This was initially the most challenging task as students had no experience how to weave a title for the similar activities they had selected from the website. The iEARN experience had the element of student–student, teacher-teacher and student –teacher collaboration in a constructivist learning environment. The experience motivates us to upscale the project to a larger group as the response has been positive and the benefits have been useful to three key people in teacher education, the student-teacher, the teacher educator and the learner in the school. 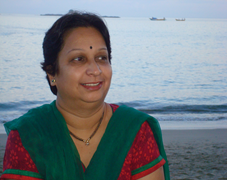 Jayashree Inbaraj has more than 20 years of experience in initiating and coordinating international projects on school linking and global citizenship. She was conferred a doctorate in 2011 in education Her association with international partnerships dates back to 1992 when she coordinated with Mr. Greig Whitehead to initiate links with Schools in Australia in a project called Kids Contact. That experience led to projects like the Global Footsteps for schools a school links project between UK and India and several others followed like the Gardens for life project and currently the ICC project. Dr. Jayashree Inbaraj also has a background in teacher education has more than 18 years of experience in the field of teacher education. She teaches both at undergraduate and post-graduate level for courses in education. She is currently an associate professor and a senior faculty member at the Smt. Kapila Khandvala college of Education, Mumbai in and works closely with schools and colleges in Mumbai to conduct teacher development programs. The subjects she teaches are Psychology and Action research. She is on several syllabus revision committees of the Mumbai University and recently on the teacher education syllabus committee with Tata Institute of Social sciences. She is currently also a mentor for the British council GTA program that involves mentoring teachers in action research projects.